We all know pasta is just about the easiest thing ever to make, but I've been curious about this one-pan method by Martha Stewart. Apparently, if you make it in a shallow bit of water, you cut down on cooking time and have one less thing to clean. There are all sorts of recipes on the internet since that post went viral a few years ago. Since I probably make peanut butter noodles once a week, I decided to try my version of that. The first time I did this, I used soba noodles (my go-to for peanut butter pasta). However, cooked this way, it gets waaaay to gummy and clumpy. You're going to want to use a spaghetti or linguini, since they require the longer cooking time needed to absorb the water. Plus, the pan ingredients are constantly being tossed around, so you need a tough pasta. Look alive and make sure you're constantly moving that pan around! You can also use a pot to cook it, but I think it looks nicer served straight from the skillet. It tastes great hot, but will still be delicious served cold the next day. Add some rotisserie chicken or tofu, some wilted greens, and you've got a really quick and easy dinner. Put all of the ingredients except the scallions and sesame seeds in your pan. If the pasta doesn't fit your pan, break it in half. I used a 10.5 inch stainless steel skillet. Turn the heat to medium high. When the water comes to a boil, set the timer for 9 minutes. Every 30 seconds or so, use tongs or a pair of chopsticks to break up the peanut butter and stir the noodles around. Make sure they don't stick to the bottom of the pan. When most of the water is absorbed and the noodles are peanut buttery, turn the heat off, and garnish with scallions and sesame seeds. Disney provided media passes for this post, but I purchased all food. We have been getting a lot of rain in Southern California lately. I'm really not complaining - especially not after the LA drought for the last few years. I haven't been back to Disneyland since taking Leslie Durso and Melanie Maras for their birthdays last spring. So Abe and I look at our calendars and realize we need to go NOW, before he begins a new full-time job and his weekdays are no longer free. The only time we can do it, there is rain forecast for the entire day. Still, I am determined. I pull on my Bogs Rain Boots (still my favorite) and layer up. Sadly, this is the first time I can't wear my Minnie Ears, since I have to keep my real ears warm! We don't go first thing in the morning, like usual. We hit the park around 2pm, and grab a late lunch (without having a reservation) at Carnation Cafe. I have dreams about the fried pickle spears there. The last two times I visited the park, the lines were intense. This time, we flew through every ride. We hopped between both parks and got to experience the new Soaring Over the World. Plus, the skies cleared up, which meant we'd be able to see the evening's entertainment! 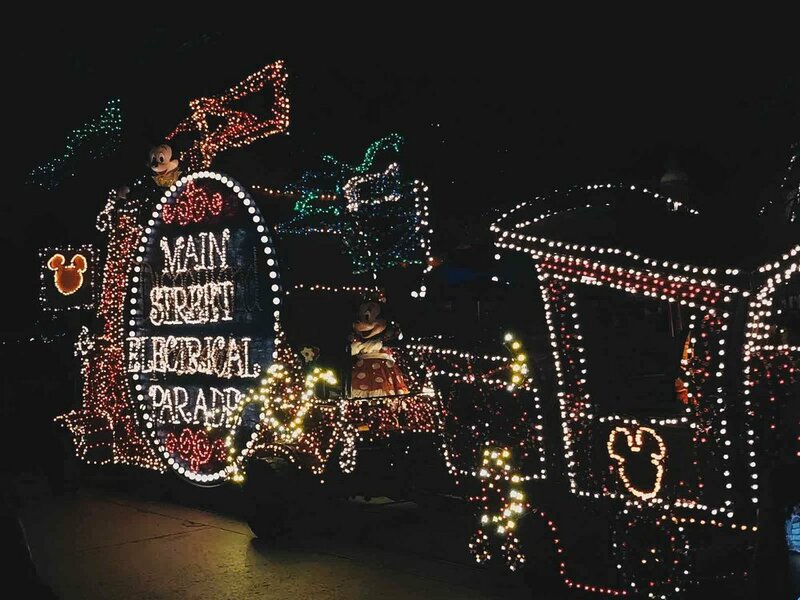 The Main Street Electrical Parade is back (for a limited time - through June 18th)! This is really the reason I had to get to the park ASAP. I haven't seen this parade since I was a little girl at Disney World; in college I used to dissect the "Baroque Hoedown" song with my fellow music geeks. There are a bunch of parade-themed treats available throughout the park too - including these Cheshire-Cat and Caterpillar Marshmallow Wands (similar to the Tigger Tails I love). Check out the video below to see me cry like a baby during the parade. When people ask about my big brother Morgan, I always describe him as Bart Simpson. I would be Lisa, except not as book smart. He was the troublemaker, and I was the kid who never got in trouble. And we fought a lot. Except when we were in front of the television - then we got along fabulously. We watched all the things together - including The Simpsons. When cable first came along, you had to press buttons on a box to change the channel. I can still remember what it felt like beneath my fingers, and if you pressed two buttons at once, you could hack into the paid stations like HBO. It was our bond, the television. Where mom and dad couldn't bother us and we could escape into other families' lives. Now we are grown up. And this trip to Universal Studios together is actually pretty healing. Along with breakfast at Harry Potter World, we head into Springfield to check out Abe's work on The Simpsons Ride, plus lunch at Krusty Burger. I get the veggie version, which comes with a pile of soggy crinkle cut fries. Sadly. this is a very lackluster meal. The veggie patty reminds me of the cafeteria food in college, and that is not a good thing. However, the Lard Lad Donuts (in the video) are not only the best deal in Universal Studios Hollywood for $5, but also the most delicious. More Springfield theme park food options below. See if you can spot the Flaming Moe!